Tell me if this sounds familiar in the mornings. Walking into the bathroom, you stand infront of the mirror, a ton of products sitting at the basin area waiting to be applied onto your face. You end up using just one or two. That's me! Cleanser then moisturiser. IF I am not lazy, I will apply a sunblock but that's rare. I prefer a fuss-free facial cleansing ritual and Cetaphil fits the bill. Originally developed by skin experts, Cetaphil Gentle Skin Cleanser is a soap substitute that preserves your skin's natural moisture. So it softens your skin as it gently cleanses. Its special formulation won't sting your eyes and can remove light make-up without clogging pores. It also does not leave a sticky residue over the skin surface. Developed to be used with or without water, Cetaphil Gentle Skin Cleanser is pH balanced and lanolin and fragrance free. It's non-drying and non-irritating properties makes it a gentle formula ideal for every age, every stage and every day. 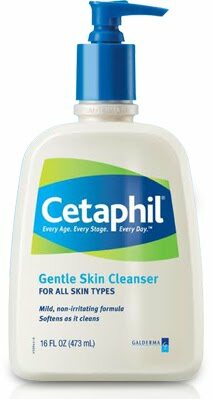 Cetaphil is the leading brand of gentle skin cleanser in Singapore. Giveaway is limited to one entry per twitter account, and those residing in Singapore only.